Huzzah! 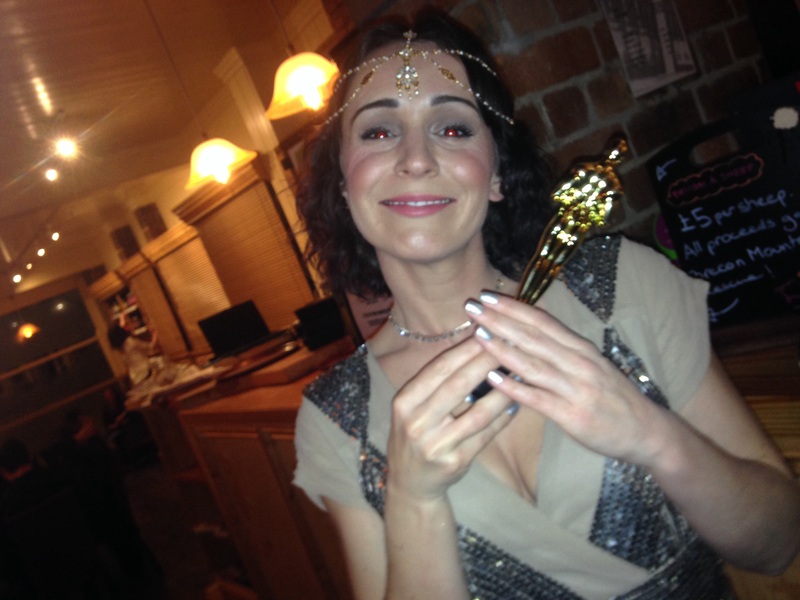 Greed The Movie has won its first film award. 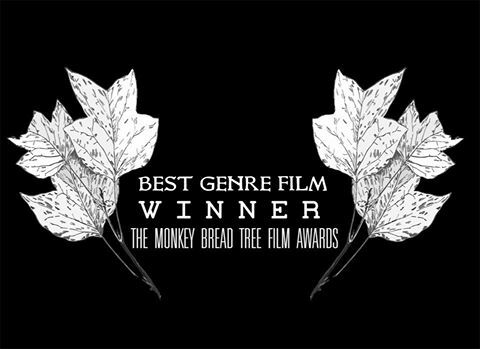 The Monkey Bread Tree Film Awards has given Greed the Best Genre Film Of The Season 2017 award. 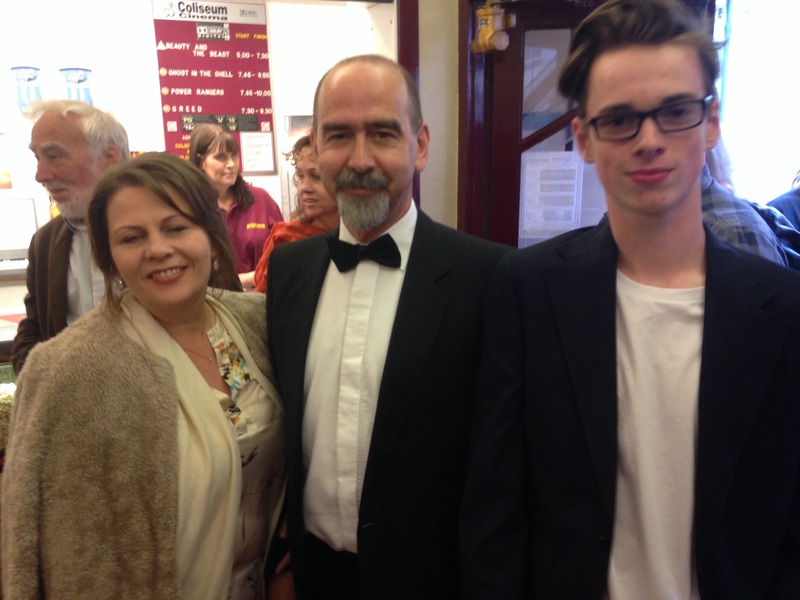 Look out for Greed at film festivals this spring. 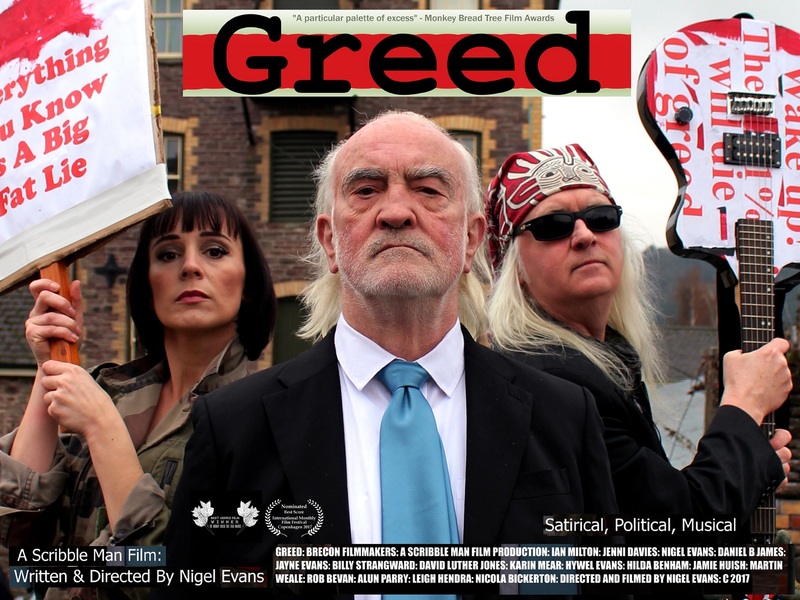 Or if you have a film society and would like to show Greed as part of your progamme, please contact Nigel – maxencala@gmail.com. We started filming Greed The Movie a year ago and it’s finally coming to a close with only a few shots left to do. With no real budget to speak of, I’ve recently discovered the term ‘shreditor’. A shreditor shoots, edits, writes and sometimes performs in front of the camera in the film making process. Well, that’s me I suppose, not through any desire to control the whole thing. Okay, that’s a barefaced lie. I am a control freak. It does mean though that along the way, I’ve learned how to make a movie. I’ve learned the difference between a panning and a tracking shot. How to frame shots like Stanly Kubrick would. And about the job of the colourist. And how to synch sound, which is quite important seeing as Greed is a musical really. Without sounding like I’m already making my Oscar acceptance speech, it could not have been done without the actors, singers and musicians from Greed donating their valuable time. Everyone is so busy, it’s a busy world nowadays, so I appreciate it when they’ve given up their time to be pushed around on a child’s roundabout (Dan James) or be put in a red rowing boat on a small pond (Ian Milton). Mind you, during the last year, Ian has walked around Brecon as Rotkin wearing a builder’s dust mask, he has laid out flat on his back on a tombstone in Cradoc Cemetery, he’s danced in Free Street (ironically) and sung on The Bulwark. All for art, all for the camera (it loves you, Ian) and all for Greed. And now this, seemingly random at times, collection of scenes and performances is begining to look like a film. There is a logical order from the stage show, a skeleton of a story, to follow of course but this isn’t the stage show. It’s a film and maybe there should be some semblance of a story. I had a screenplay at one stage. However, that developed on an almost daily basis and morphed. Filmmaker blogs say that you should ‘show’ the story and not ‘tell’ it anyway. I’m relying on the intelligent, curious and inquisitive mind of mankind to fathom it out. That’s the plan anyway. It’s art after all. So we have bishops driving around in souped up BMWs, poor Jenni as Elin braving cobwebs in a dark, dank shop basement, doubling as a Parasite prison, David Luther Jones the cab driver playing the part of a mad poet cab driver (Stanavlaski style) and the wonderful Scrachans and Choir Boys doing their bizarre thing. No one has really questioned why. I’m grateful that no one’s really done a movie actor diva thing. ‘What’s my motivation here? Why am I stood on the Beacons in the freezing cold? Why exactly am I singing this song doing the washing up?’ Everyone has just gone along with it. I thank you for that. The next stage is a final edit. This filmmaking malarky is still quite new to me and I believe the best route after its final cut, is to enter Greed into film festivals. It’s political, it’s a musical, it’s Welsh, it’s topical, it has a backstory, made on a shoestring by a bunch of friends. It’s got legs as they say. It hasn’t got any car chases, no elves. There’s no swearing. It’s not quite the Hollywood template. Matt Damon’s not in it. Nor is Adam Sandler. Sadly, it’s not set in Norway or Denmark but it is set in Wales. It’s Welsh Noir. 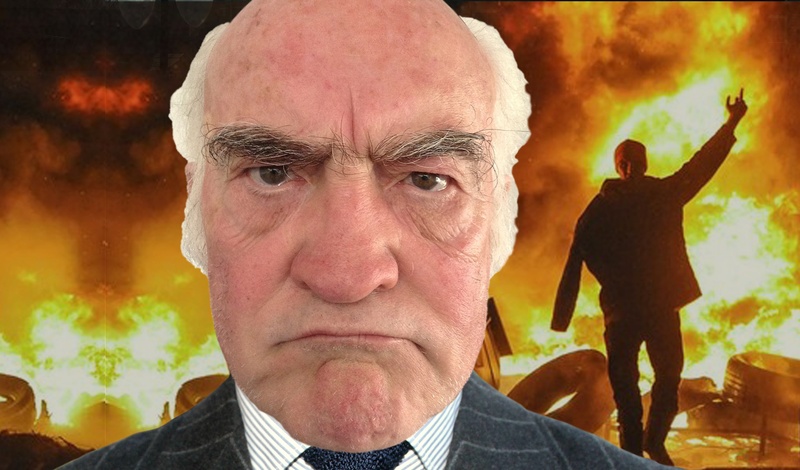 It could be tempting to put scenes on social media, chuck a song or two on YouTube but no, not for now. Of course, you’ll see production stills. I read that early on – always take pictures while you’re filming. I’ve tried. It’s not always possible when you’re worried that the light is terrible or the camera’s battery is flagging or the memory card is almost full and you didn’t bring another one. Thanks to Karin and Jamie for pointing iPhones at people. Greed started as a recording thing and people will remember coming to the space above Canter Happy to record their bit, in the middle of the night mostly. Then the idea of a stage show. After Billy did his guitar sessions, he said: “If you take it on the road, say the word and I’ll be there.” Greed The Rock Opera on stage was mad and very difficult to do really. So much rehearsing. But I’m sure the 15 people who were at our last performance enjoyed it. And that’s why a film was made. To reach more people. 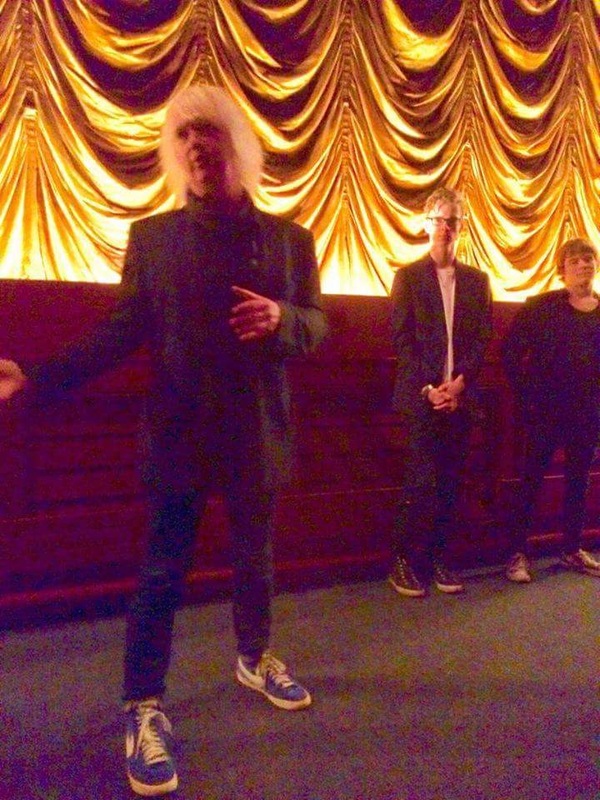 It’s the logical combination of sentiment, story, music and visuals. Areas that I’ve dabbled in all my life. All brought together. Greed The Movie. It’ll actually be called just Greed. Everone understands Greed. Greed will make the world grind to a halt one day. Can a film put a stop to that? Who knows. We can only try. Bring Greed to a venue in your town! Book Greed The Rock Opera. There I’ve said it. That’s pretty direct. 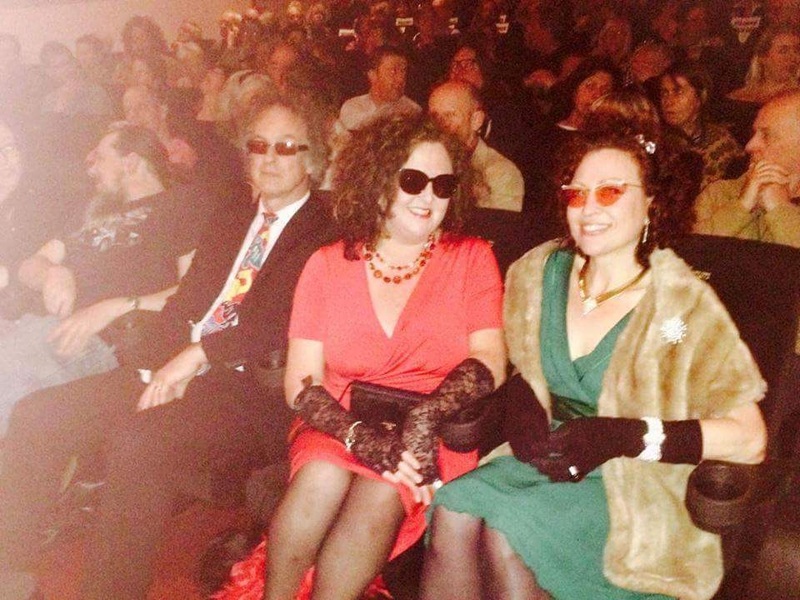 It’s a rock opera, it’s a night out. If you care about your world, hassle your local venue (biggish) now. It’s a live show about greed. The 1% who are in the lap of luxury and the 99% who are exploited and generally conned. It’s got a storyline and everything. 16 people on stage at any one time, though mainly it’s five or six. Greed is also an album which you can download for free at http://www.scribbleman.bandcamp.com. 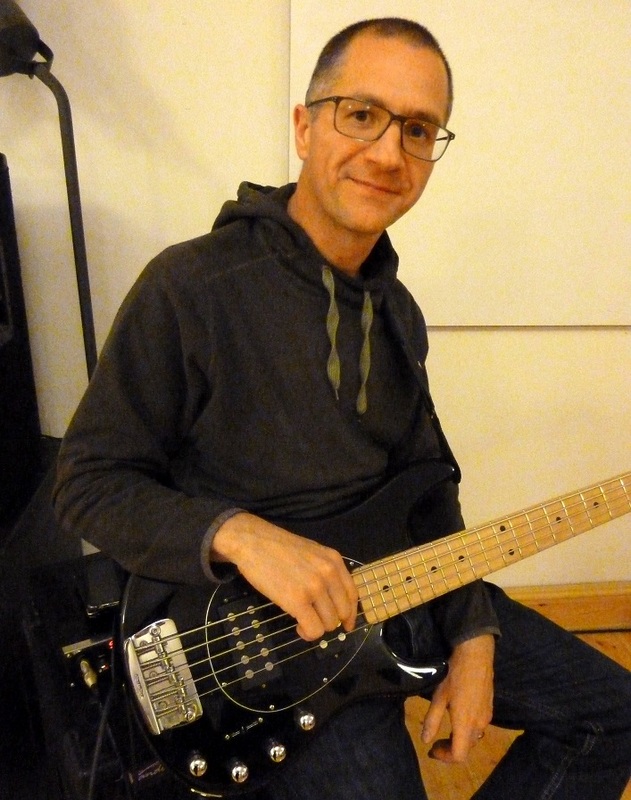 Phil is pictured in rehearsals at The Muse, Brecon with a five string Musicman bass. He tells us that he can play all five though not necessarily at once. Phew!